The countdown to May 5 is on, as the PTA80 makes her way to Palma, Mallorca this weekend. After a few delays early in the journey from Sweden to Spain, it’s smooth sailing once again for the PTA80 patrol vessel as she makes her way to Palma, Mallorca. The boat was loaded onto the Mitiq, which departed from Bremerhaven, Germany, on April 23. Since departure, the Mitiq has experienced good weather, and today she’s on her way to Southampton. She will arrive in Palma on May 1 and will be met by Klas Karlsson and several representatives from the local Volvo Penta dealer, Camber Marine, who will unload the PTA80 and get her into the water. She will be cleaned, if necessary, and prepared for her debut seminar on May 5 at Club de Mar Marina in Palma. Ulf Eliasson, part of the marine sales engineering department at Volvo Penta, will join the team from Gothenburg and be the first featured speaker of the Volvo Penta IPS Med Trip. The informational seminar will be followed by an opportunity to test out the PTA80 and take the Volvo Penta IPS system to the high seas. This entry was posted in Uncategorized on April 25, 2014 by Volvo Penta. One leg down, one more to go: Volvo Penta’s PTA80 arrived in Bremerhaven, Germany, on April 16. From there she prepares to depart for Palma, Mallorca — the May 5 launching spot for the Volvo Penta IPS Med Trip. Despite a few snags, according to Klas Karlsson it’s “so far so good” for the PTA80 in her journey from the Volvo Penta marine test center at Krossholmen, Sweden, to Bremerhaven, Germany. From Bremerhaven she will depart for Palma, Mallorca — her first port of call on the Volvo Penta IPS Med Trip. Klas, who works at the Volvo Penta marine test center at Krossholmen and who met the boat when she arrived in Bremerhaven on April 16, will also meet the boat in Palma when she arrives on April 24. The PTA80 departed Krossholmen at 7 a.m. April 12 and traveled in tranquil waters via Middelfart, Denmark, arriving in Kiel, Germany, 13 hours later. 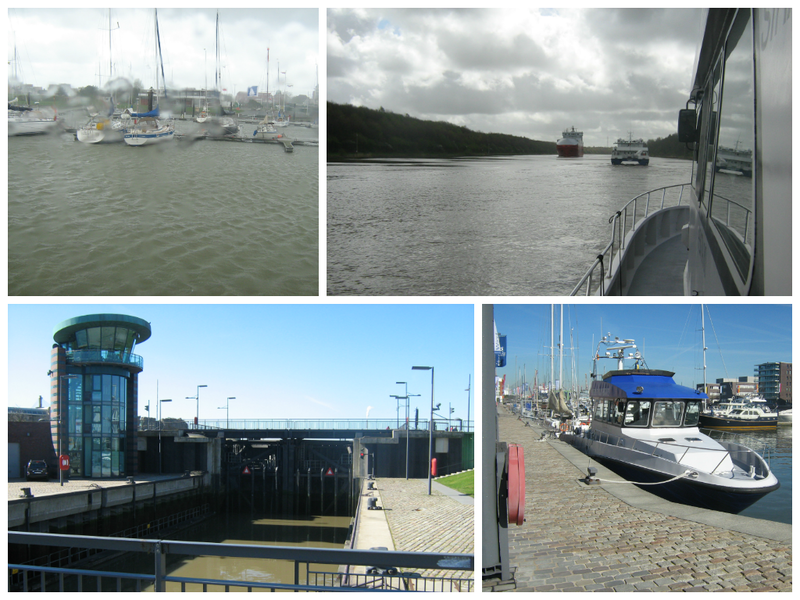 Bright and early the next morning, she entered the Kiel Canal, which links the Baltic and North Seas. After traveling the 98-kilomter canal for six hours, she moored in Cuxhaven on the North Sea at the mouth of the Elbe River. Taking the Kiel Canal instead of going around the Jutland Peninsula can cut a boat’s journey by an average of 460 kilometers. It wasn’t all smooth sailing, though. The crew had planned to leave Cuxhaven on April 14, but due to high winds, had to stay over an extra day — losing valuable travel time. Once the boat finally departed on the 16th, she made the 100-kilometer journey to Bremerhaven in 3.5 hours. The PTA80 will be loaded aboard the Mitiq, a yacht transport ship, for passage to Palma on April 22 — which is yet another one-day delay due to earlier loading and unloading problems in Scandinavia. 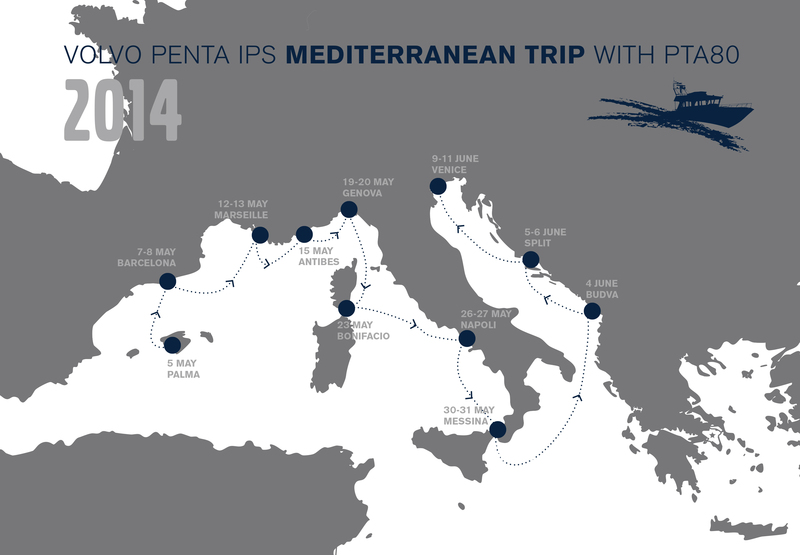 The setbacks are not anticipated to delay the start of the Volvo Penta IPS Med Trip on May 5. This entry was posted in Uncategorized on April 17, 2014 by Volvo Penta. There’s still nearly a month to go until the Volvo Penta IPS Mediterranean Trip takes off from Palma, Mallorca, but behind the scenes there’s a flurry of activity — and excitement. When the Volvo Penta IPS Med Tour takes off from Palma, Mallorca, on May 5, the company’s 22.5-meter PTA80 patrol vessel will cover 2,200 nautical miles, making 11 stopovers in five countries over the course of 38 days. A trip of such magnitude isn’t easy to put together. And it certainly can’t be organized overnight. In fact the Volvo Penta IPS Med Trip has been in the works since last summer’s Channel Tour. But now, less than a month out, the trip is beginning to take shape. To prepare for the journey, the crew at Volvo Penta’s marine test center, Krossholmen, updated the boat’s Volvo Penta IPS900 and installed new 700 hp D13 engines last week, before putting her through her paces at sea. 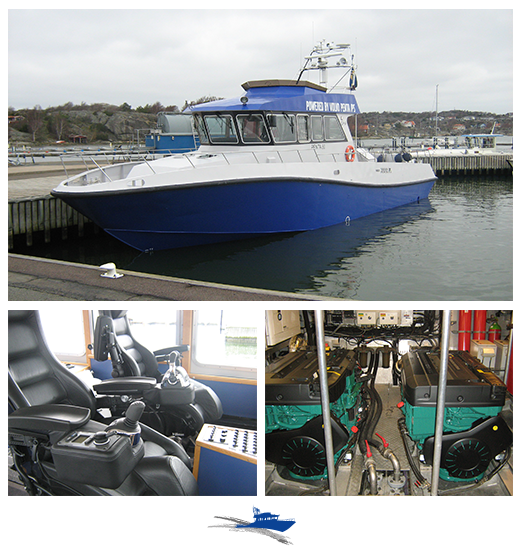 The boat has also received a fresh coat of paint — in Volvo Penta blue and white. And on Saturday the PTA80 will depart Krossholmen, near Gothenburg, Sweden, and make a 24-hour trip to Bremerhaven, Germany. There she will be loaded onto a ship and transported to Palma, where she will arrive on April 24. Klas Karlsson, who works at the test center at Krossholmen, will meet the PTA80 in Palma on May 2 and prepare to captain the boat on the first of the trip’s four legs — Palma to Marseille. He’ll be accompanied by an engineer, as well as members of Volvo Penta’s sales and aftermarket staff. This will be Klas’s third trip, after also captaining the PTA80 during 2011’s Baltic Trip and 2013’s Channel Trip. This entry was posted in Uncategorized on April 11, 2014 by Volvo Penta. After a highly successful Baltic trip in 2011 (Northeast Europe) and a Channel trip (Western Europe) in 2013, the journey continues in Southeast Europe with the Mediterranean Trip! Over the course of 38 days, Volvo Penta will visit 11 cities along the Mediterranean Sea with the PTA80, a patrol vessel equipped the Volvo Penta IPS pod system. At each of these stopovers, visitors will have the chance to experience firsthand the high-quality features of the Volvo Penta products. With planned stopovers in Spain, France, Italy, Montenegro and Croatia, the Volvo Penta IPS Med trip will be one of the busiest events the company has ever organized. Even if you’re not located in one of the countries on the IPS Med tour, please consider joining us at one of our stopovers. Contact your local Volvo Penta office to find out more about how you can visit us on the Volvo Penta IPS Med trip. This entry was posted in Uncategorized on April 8, 2014 by Volvo Penta.